The Reuben Benedict House, a two-story brick building with a wooden frame addition, lies in the rural farming community of Peru township. 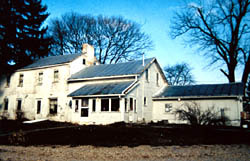 One of the earliest houses in Morrow County, Ohio, it stands surrounded by ageless maple and walnut trees. The Benedict house was an active station stop on the Underground Railroad, as well as a model of antebellum Quaker architecture. Out of the estimated 100,000 fugitive slaves who escaped with the assistance of the Underground Railroad at least 40,000 went through Ohio. The Alum Creek/Peru Township area contained a sizeable free and fugitive black population, an active Quaker fellowship, and a local community with strong convictions about the immorality and injustice of slavery. These combined characteristics made Peru area an ideal Underground Railroad station. In 1812 several Benedict families migrated from New York to Ohio and established the first Quaker settlement of Morrow County, Ohio along Alum Creek. The Benedicts were the first Anglo-Americans to this previously unsettled frontier area of Ohio. Reuben Benedict, along with his wife Anna and their 12 children, were among these families. Benedict was the first recorded miller in the township. Numerous accounts confirm that the Reuben Benedict house was a station stop on the Underground Railroad. A history of Peru Township written as early as 1897 states clearly that "Reuben Benedict's House is now Harry Green's and was on the Underground Railroad." The house also played a role in the locally famous 1839 case of Bill Anderson of nearby Marion County, Ohio. During Anderson's trail, also known as "Black Bill," a group of Virginians attempt to return him to Virginia. Because Anderson was considered a free man by the court, and the Virginians could not prove ownership, he was released. However, after a second attempt to take Anderson to Virginia, a group of local Quakers helped him to Benedict's house to escape further capture, and from where he could move further north. The Benedict house is a unique Underground Railroad station because it retains a high degree of historic integrity. The house maintains much of its original plan and design, and is one of the few examples of the Federal vernacular style surviving in the area. The Reuben Benedict House is located at 1463 County Rd. 24, in Peru Township near Marengo, Ohio. It is a private residence, and is not open to the public.